The 10th day of Muharram, the first month of the year 1433 according to the Islamic lunar (hijri) calendar, correlated with December 5-6 in Western measurement. Then, and on the following weekend in some Western countries, Muslims commemorated Ashura. The date recalls the martyrdom of Imam Husayn in 680 CE at the massacre of Karbala in Iraq. Imam Husayn was the grandson of Prophet Muhammad, as the younger son of Muhammad's cousin, Imam Ali Ibn Abi Talib, and Muhammad's daughter Fatima. Imam Ali was the last of the four original successor-caliphs to Muhammad. For Shia Muslims and many Sunni Sufis, the 10th of Muharram has intense significance. Non-Muslims and academic experts may ascribe Imam Husayn's death, and the conflict that brought it about, to nothing more than internal rivalries in the family of Muhammad. On one side, Muhammad's wife Aisha, the daughter of the first caliph, Abubakr, opposed Ali, Fatima, and their sons. She was joined and echoed in this posture by protégés of the second caliph, Umar Ibn Khattab, whose daughter Hafsa was married to Muhammad, and by relatives of the third caliph, Uthman Ibn Affan, who married Muhammad's daughters Ruqayyah and Umm Kulthum. This struggle has been presented typically as motivated by the conviction of the supporters of Imam Ali that only the descendants of his and Fatima's branch of the Prophet's family were fit to govern the young Muslim community, or ummah. Imam Ali was a superlative Muslim. He was the first to follow Muhammad in accepting the message of Islam. Among the closest personalities to Muhammad in the Prophet's lifetime, Ali is identified as the progenitor of nearly all Sunni Sufi orders, as well as of the Shia sect. The argument that he was the preferable claimant to Muhammad's succession as commander of the faithful is strong. Imam Ali was the victim of intrigues and was assassinated in 661 CE. But the drama of Shiism has less to do with Imam Ali himself, than with the trauma of Imam Husayn's death in Karbala, 20 years later. In the intervening decades, a despotic style of governance had been imposed on the Muslims from Damascus, formerly a Byzantine center, by the Umayyad dynasty. The Umayyads originated from among the associates of Caliph Umar and relatives of Caliph Uthman. Imam Husayn had received anguished appeals from the Muslims of Kufa, the Islamic capital moved from Medina and established by Imam Ali in Iraq. The Kufans called on Imam Husayn to lead an effort for rectification of the community's leadership. Thousands pledged that they would support him against the Umayyads. Imam Husayn reached Karbala, on the road to Kufa, with some 72 fighters. But the Kufans failed to fulfill their promise of assistance to him. Facing a large Umayyad army, Imam Husayn was killed with his infant son. He was decapitated and his teeth knocked out of his head. Zaynab Bint Ali, Husayn's sister, was taken as a captive to the Umayyad court in Damascus. There she denounced Yezid, the despot who took over the caliphate and had ordered the killing of her brother. For that reason, Zaynab will receive special honors from Shia Muslims during the 40 days of mourning following Ashura. 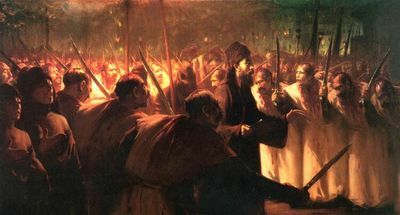 Imam Ali and Imam Husayn are perceived by Shia Muslims as exemplars of social justice within Islam, more than as protagonists in a family rivalry over the caliphate. The Bektashi Sufi Baba Rexheb Beqiri (1901-95) an Albanian who established Bektashism in America after the second world war, wrote memorably about Ashura as a primary Bektashi observance. He commented that Imam Husayn was killed because he "kept alive the flag of liberty, the prestige of religious democracy." The people rebelled against the injustices of their rulers and Imam Husayn joined them in their protest, but the evil usurpers of authority replied with "terroristic actions." Today, when the Al-Assad regime in Syria pursues the mass suppression of the citizenry, in a critical period of the recent Arab turmoil, Baba Rexheb's judgment appears particularly eloquent and certain. In a terrible paradox, the Alawite sect to which Al-Assad and his ruling cohort belong has been accepted as a branch of Shiism. Yet Al-Assad acts as if imitating deliberately the cruelties of the Umayyads, who made Damascus their capital. Homicidal assaults on mourners of Ashura, by fanatical enemies of the Shias in other Muslim lands, also repeat the tragedy of Karbala. Hatred of Shias resulted in bloody atrocities in Iraq and Afghanistan last week. In Iraq, at least 32 Shia pilgrims were killed and as many as 100 were injured in bombings in Hilla and Baghdad. In Afghanistan, attacks on Shias in Kabul, Mazar-i-Sharif, and Kandahar left 80 dead and up to 132 people injured. In India, an apparent arson incursion struck the Ashoorkhana or Shia meeting house at Imam-bada in Rein Bazar, Hyderabad, and damaged property, but took no lives. Sipah-e-Sahaba and Laskhar-e-Jhangvi both adhere to Deobandism, the South Asian variant of radical fundamentalism with links to Wahhabism, the official Muslim sect in Saudi Arabia. Deobandis are best known to the world as inspirers of the Afghan and Pakistani Taliban. Lashkar-e-Jhangvi was designated an international terrorist group by the U.S. government in 2003, and is banned officially in Pakistan, but continues its terror operations with impunity from that country's territory. Shia Muslims say "Karbala is everywhere, Ashura is every day." This sentiment reflects their history of more than 1,300 years of persecution and violence at the hands of those who have declared them "kafir" or "disbelievers" (strictly defined, "concealers of truth.") They do not cease pointing out that both Imam Ali and Imam Husayn were killed by Muslims, not by Jews or Christians. Aggression against Shias is not limited to easy targets, such as Ashura pilgrims. In Bahrain, an official inquiry was established this year by the country's Sunni-minority monarchy, into atrocities against the Shia majority. Violations of human rights allegedly increased after the occupation of the island state by forces of Saudi Arabia and the Gulf Cooperation Council in March 2011. The investigators released their report last month. They confirmed incidents of killing, torture, arbitrary detention, reprisal in employment and education, and destruction of 30 Shia mosques, husseiniyat (meeting houses), and shrines. And at about the same time the Bahrain report was published, four Shias were slain when Saudi Arabian police were ordered against demonstrators in the peninsular kingdom's Eastern Province. Other spiritual groups that derive from Shiism or have adopted the Shia devotion to Imam Ali and Imam Husayn have suffered grievously in recent years. In Macedonia, the Bektashis have undergone the occupation of the Harabati Baba Teqe, one of the most significant Sufi shrines in the Balkans, by Wahhabis. 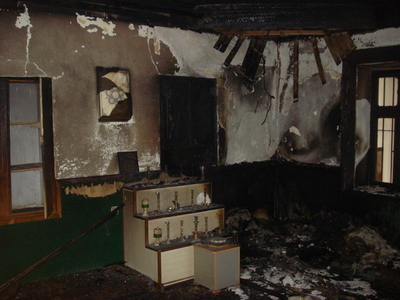 The Harabati Baba Teqe was the site of an arson raid at the end of 2010. In Turkey, Alevi and Alevi-Bektashi believers, whose tradition combines Shiism, Sufi practices, and pre-Islamic Turkish and Kurdish religion, continue to suffer insult and discrimination at the hands of the Sunni-centric "soft-fundamentalist" Justice and Development Party (AKP) led by prime minister Recep Tayyip Erdoğan. Echoes of Karbala and Ashura are easily discernible in Iran, the main Shia-majority country. Iran has been accused of inciting discontent among Shias in Bahrain and Saudi Arabia. The intention of the clerical dictatorship in Tehran is clear. The rulers of Iran wish to divert attention from the widespread disaffection with their governance in the ordinary Iranian population. They also wish to distract their subjects from factional competition at the summits of power. And they need to defuse the alarm of their people over their nuclear adventurism. What, finally, are the lessons of Ashura today? First, there should be no doubt that the rapid U.S. withdrawal from Iraq, failure to curb Pakistan-based terrorists both in their own land and in Afghanistan, the slow process of reform in Saudi Arabia, and provocations by the Iranian regime will result in more murder and torment of innocent Shia Muslims. Second, and more important, the example of Imam Husayn in sacrificing himself for the betterment of the Muslim community must compel Shias and sincere Sunnis to ever-greater efforts for legitimacy, transparency, and freedom of thought within the ummah. The rebellions of the once-celebrated "Arab Spring" shared, at their commencement, in the spirit of Imam Husayn. The cycle of radical Islam that began in Iran in 1979 and culminated in the atrocities of September 11, 2001 in the U.S., appeared to be approaching its end in the mass upheavals in Tunisia, Egypt, Libya, Yemen, Bahrain, and Syria. Yet the Sunni-centric Muslim Brotherhood and the Wahhabis (camouflaged as "Salafis") of the Nour party have swept to an apparent electoral victory in Egypt, a country with a small Shia minority, that, like Coptic Christians, will be vulnerable to abuse. Still, as the movement for social transformation gives way to ideology masquerading as religion, Husayn, Karbala and Ashura are no less relevant for Sunnis, and especially Sufis, as for Shia Muslims. Muslim believers must confront the real threat of a new arc of extremism in Arab Islamic history. Shia Muslims have made important contributions to Islamic thought and deserve the respect of all Muslims, as well as non-Muslims. Muslims will require the wisdom of Imam Ali, the fortitude of Imam Husayn, the outspoken courage of Zaynab, a clear memory of the tyranny of the Umayyads and of the symbolism of Karbala, and the spiritual sustenance of Ashura to follow a straight path to freedom in the coming years, if not decades.